As is often the case, Seattle is on the leading edge of a new wave. First it was the boutique wineries and the craft breweries. This time, it’s the craft distillery wave that is taking over the city. There are literally a couple of dozen craft distilleries flourishing in the area, all creating their own distinctive spirits. Each has its own personality which translate into an astounding selection of quality distilled spirits ranging from whiskey to gin to rum and liqueurs. With so many distilleries to choose from, it’s difficult to decide where to go, and unless you live in Seattle or have a couple of months to spare, you won’t be able to sample them all. There are two that stand out within the Seattle downtown area that are definitely worth visiting. And they are within easy walking distance of each other or just a quick Uber ride apart; OOLA Distillery and Copperworks Distilling Company, which you can read about in a recent article. OOLA Distillery calls the Capitol Hill area home. Casually tucked into the cityscape, the 5,000 square foot distillery and tasting room is friendly and welcoming, with the vibe that Managing Director Alan Jackson said he felt the first time he entered the premises, four-and-a-half years ago when he joined the company. “When does a 50-year-old guy get a chance to hit the reset button and get in on the ground floor of something he had an instant connection to?” he posits. Standing behind the tasting room bar, Alan, who spends a lot of time traveling said when he is on the go, he has the pleasure of bragging about the production staff and the quality of the products produced. "We're not related by blood, but we're a unique family." 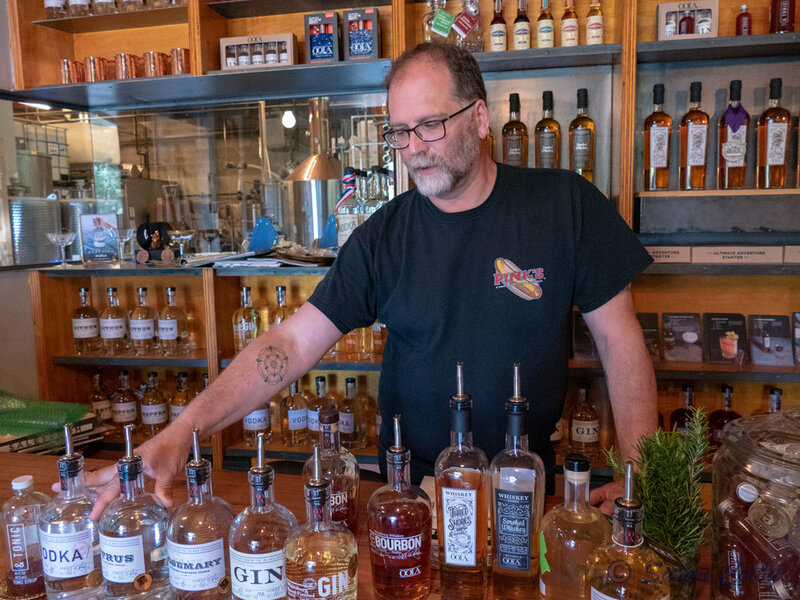 Head Distiller and owner Kirby Kalla-Lewis is the visionary behind OOLA Distillery and has the distinction of obtaining the second commercial distillery license within the Seattle city limits. He and his crew also hold one of the best-kept secrets as far as privately held Washington State distilleries go. OOLA is the second largest producer in both volume and revenue, behind Heritage Distilling. As successful as the distillery is, Kirby is adamant about not selling out to a large conglomerate as a couple of other local distilleries have but acknowledges that “consolidation happens.” He also acknowledges that independent distilleries often need outside money to prosper and said he would welcome outside equity investors. From the custom designed-and-built still to the steampunk-looking vodka stills that make "fabulous base vodka," Kirby has the vision to see what needs to be done. Sustainability is a key issue for OOLA and to that end, after a discussion with a bartender who bemoaned the fact that the beautiful craft spirit bottles were discarded, ALOO, a special bar brand of gin and vodka was developed. Sold to the trade in standard size, screw top and well-friendly bottles, the vodka recently won Best of Category from American Distilling Institute. Being conscientious about the ecological footprint OOLA may leave, changes have been made recently in the production area. The boiler which originally produced 275,000 BTU was upgraded to 1.2 million BTU, thereby heating the mash water in 25 minutes instead of 16 hours, using $1,000 less gas every month. In another environmentally conscious move, the water-cooling system for the entire operation was re-configured. Mad Scientist Kirby figured out a way to reduce the 2,200 gallons of water used daily to almost nothing, as all the water is now recycled in a closed system. Not only does this help the environment, but it helps the bottom line as well, reducing cost by $6,000. As a true grain-to-bottle small-batch distillery, and with a commitment to quality production, the organic soft white winter wheat that forms the base of OOLA’s white spirits is from the grower who supplies Bob’s Red Mill. The corn for the whiskey also comes from this grower near Walla Walla in Eastern Washington. With upgrading and expansion in mind and underway, a new still will be installed soon and OOLA Distillery is developing a second facility in the up-and-coming Georgetown area. Stay tuned! Barely a mile away, on the Seattle Waterfront is Copperworks Distillery. Housed in an historical building, the big copper stills dominate the still room and are viewed easily from the tasting room overlooking the still floor. Copperworks has a completely different vibe than OOLA Distillery but is equally fascinating. Read about the 2018 Distillery of the Year here. Newer PostHappy New Year - and a Gift for YOU!